A new set of fossil discoveries show that the evolutionary arms race that are forests started with plants that literally had to rip themselves apart in their battle for the canopy. The first forests on this planet arose some 385 million years ago and were unlike anything we know today. They consisted of a clade of trees known scientifically as Cladoxylopsids, which have no living representatives in these modern times. How these trees lived and grew has remained a mystery since their fossilized trunks were first discovered but a new set of fossils from China reveals that these trees were unique in more ways than one. Laying eyes on a full grown Cladoxylopsid would be a strange experience to say the least. Their oddly swollen base would gradually taper up a trunk that stretched some 10 to 12 meters (~30 - 40 feet) into a canopy of its relatives. They had no leaves either. Instead, their photosynthetic organs consisted of branch-like growths that were covered in twig-like projections. Whereas most fossils revealed great detail about their outward appearance, we have largely been in the dark on what their internal anatomy was like. Excitingly, a set of exquisitely preserved fossils from Xinjiang, China has changed that. What they reveal about these early trees is quite remarkable. As it turns out, the trunks of these early trees were hollow. Unlike the trees we know today, whose xylem expands in concentric rings and forms a solid trunk, the trunk of Cladoxylopsid was made up of strands of xylem connected by a network of softer tissues. Each of these strands was like a mini tree in and of itself. Each strand formed its own concentric rings that gradually increased the size of the trunk. However, this gradual expansion did not appear to be a gentle process. As these strands increased in size, the trunk would grow larger and larger. In doing so, the tissues connecting the strands were pulled tighter and tighter. Eventually they would tear under the strain. They would gradually repair themselves over time but the effect on the trunk was quite remarkable. In effect, the base of the tree would literally collapse in on itself in a controlled manner. You could say that older Cladoxylopsids developed a bit of a muffin top at their base. A cross section of a Cladoxylopsid trunk showing the hollow center, individual xylem strands, and the network of connective tissues. Although this seems quite detrimental, the overall structure of the tree would have been quite sturdy. The authors liken this to the design of the Eiffel tower. Indeed, a hollow cylinder is actually stronger than a solid one of the same dimensions. When looked at in the context of all other trees, this form of growth is pretty unique. No other trees are constructed in such a manner. 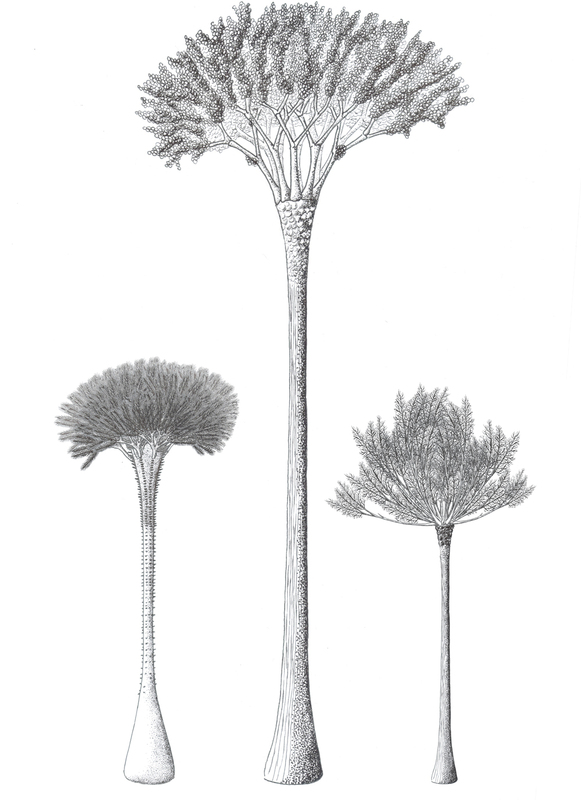 The authors speculate that this form of growth may be why these trees eventually went extinct. It would have taken a lot of energy to grow in that manner. It is possible that, as more efficient forms of growth were evolving, the Cladoxylopsids may not have been able to compete. It is anyone's guess at this point but this certainly offers a window back into the early days of tree growth. It also shows that there has always been more than one way to grow a tree.